Canada Day weekend events in Toronto is our guide to events happening this Friday, Saturday and Sunday. Here's what's happening in Toronto this June 27-29, 2014. On the dawn of Rob Ford's eminent return, let us party with forgiveness in our hearts over the fact the Mayor missed one of Toronto's biggest events of the year - forgiveness and hope that it gets better (if we vote as hard as we party for Pride, it can get better - I believe it!). Toronto's World Pride celebrations are North America's first, and art exhibits, conferences, comedy shows, drag shows, and parties are already dotting the city (check out our party guide here). If you got a crazy haircut just for Pride, you automatically get 2014 points. The points can be redeemed at City Hall after June 30. Check out our World Pride preview here. Pride parades are: Friday: Trans March. Saturday: Dyke March. Sunday: Main Parade. June 20-29. They are still kicking those balls around. Whether your passion is ignited by love of the game, slightly unfounded four-generations removed patriotism, or you're just a literary dandy trying to channel the spirit of Hemingway into an awkwardly transparent enthusiasm for blood, we've got a list of the city's best patios from which to watch, and a round up of where to watch the game depending on which country has the cutest dogs - I mean which country you hope kicks balls best. Until July 13. Post Dyke March (also free!) thousands of lesbian, trans and gay marchers will head to Lipstick Jungle for a banging outdoor dance party. DJs include Kim Ann Foxman, Francesca Lombardo, and Tizi. Saturday, June 28, 1pm, Green Space On Church (519 Church Street). Post Pride Parade this party includes Lydia Lunch, plus Hervana, DJ Steve Rock, Zoo OWL, Unfinished Business, No Pants Society, PANTYCHRIST, Judy Virago and Igby Lizzard Trash Cabaret and more. It all goes down at Alexander Parkette outside Buddies in Bad Times Theatre (12 Alexander Street) from 2:30-11pm. June 29. The Church-Wellesley Village is going car-free for Pride, and giving the streets over to a marketplace, food and drink vendors, performers, and everyone you know wearing sunglasses because last night - last night. You know this is where the pugs are going to be! In fact next to Woofstock, the dog watching/strutting action at this fair will probably be the best of the summer. Get out and make new friends. Friday - Sunday, various times. 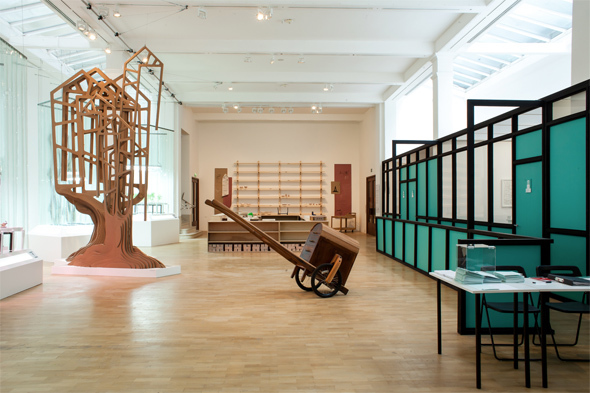 Opening tonight is one of the shows I'm most looking forward to this summer, the therapy hub by Mexico's Pedro Reyes, which might say something about me, I'm not sure. The ongoing performance piece offers short therapy sessions for those feeling the woe of urban life - a receptionist will schedule an appointment just for you, you'll sit in a waiting room with other gallery visitors, and then a Reyes-instructed therapist will do their best to settle some ennui. The physical installations themselves look to be interesting as well. The Power Plant (231 Queens Quay West), June 28 - Sept 1. Opening reception Friday, June 27, 7pm. The opening gala of TUPF14 (Toronto Urban Photography Festival) is tonight at 918 Bathurst. TUPF itself runs at various venues June 27 - July 12 - check it all out here. Friday, June 27, 918 Bathurst Centre for Culture, Arts, Media & Education (918 Bathurst Street). Free hangs with The Sugarhill Gang and Maestro Fresh Wes. What! Friday, June 27, 9:30pm, Harbourfront Centre (235 Queens Quay West). Little Ghøs† of The RGB Collective is hosting this party at Smiling Buddha that is so psychedelic that I can't really relate it to you properly without us both candy flipping and promising to always be connected in a corner of the Buddha basement first. STÜKA (noise/drone/industrial), CHOBO (yeah, Ben Boles writes for us), Petra Glynt (yeah, I write about her every week) and more are upstairs. What's going on downstairs? I'm not sure what writing is, your face is a butterfly. Friday, June 27, 8pm, Smiling Buddha (961 College Street). If you're like me and you don't believe in anything you can't cuddle, creep up under the covers with Bertolucci's newest this weekend at TIFF. His first feature in a decade, everything is here: heroin addiction, characters rarely wash their hair because they look hotter that way, troubled familial relationships: it's cheaper than a flight to Italy and a crafty excuse to spend time with your deep crush, air conditioning. TIFF (350 King St West), various. Ford more years? Hell no. Four more years for BeerProv? If you'd drink to that (and why wouldn't you) here's where you need to be on Friday. June 27, 8pm, Comedy Bar (945 Bloor Street West). Near Dundas and Dovercourt, where the designer dog watching improves by the month, you can check out Little Portugal's newest vintage shop while eating watermelon (what? isn't that messy?). Vintage & Flea's name is pretty self explanatory: "vintage clothing, designer consignment, and antique furniture" are all promised to you watermelon loving thrifters. Saturday and Sunday, 2-9pm, Vintage & Flea (1263 Dundas Street West). Freebies, BBQ, Maya Postepski (Trust, Austra) on decks. Sunday, June 29, House (580 Church St), $10 includes drink ticket. Contributions by Benjamin Boles, Sarah Ratchford, Liora Ipsum, Jacob Thompson.